Each weekend, Horse Racing Nation previews the top races to tune into coast to coast and runs down the main contenders. Post times are all in Eastern Time. Down at Gulfstream Park West, Mr. Jordan and Deland, both 6-year olds, will square off in Saturday's Millions Classic Preview. Mr. Jordan won this race last year and is a perfect 4-for-4 at what was formerly Calder Race Track. While Mr. Jordan has lost to three rivals in this race, the “horse for course” angle should serve him well. Deland will likely be the pacesetter and jockey Emisael Jaramillo will probably try to walk the dog on the front end and prevent Mr. Jordan's rally. Post time is 1:30 p.m., making this the fourth race on the Millions Preview card. Laurel Park will host five stakes races in all on Saturday, and we'll focus on two of them. The Smart Halo Stakes for 2-year old fillies is topped by Congrats Girl. The Congrats filly has shown some class. Two starts back she was a solid second to future Breeders’ Cup Juvenile Fillies winner Jaywalk. Her main competition will come from the Wesley Ward-trained stakes winner Mae Never No. The six-furlong race could get hot as the two aforementioned fillies are just a couple who may try for the lead. Post time is 1 p.m.
Rugbyman will be searching for his first stakes win in the City of Laurel Stakes but will have to get through graded stakes placed Old Time Revival in order to do so. Seven others complete the field, including Kent (G3) upset winner Golden Brown who's trying dirt again after running in the Haskell Invitational and cutting back to a sprint distance. Post time is 3:30 p.m.
Graded stakes-placed Hot Springs will break from the far outside post as the favorite in Churchill Downs’s Grade 3 Commonwealth Turf Stakes to be run at 1 1/16 miles on Saturday. The Uncle Mo colt won the Jefferson Cup last out over this course and will be stepping back up in class. March to the Arch, who was third to Hot Springs’ fourth in the Saranac (G3), will exit post four. Reride appears to be the most likely pacesetter, while Hot Springs will sit just behind the leader and March to the Arch will come from off the pace. Post time is 5:36 p.m.
Tacitus, the first foal out of Grade 1 winner and Eclipse champion Close Hatches, heads a field of eight in the fifth race, a maiden special weight for 2-year olds, on Saturday at Aqueduct. 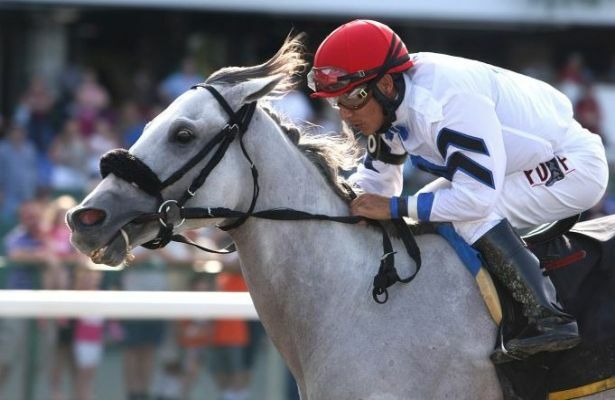 The gray Tapit homebred colt was fourth upon debut after weakening late in the 1 1/16-mile affair. He will wheel back slightly to a flat mile for trainer Bill Mott, who also conditioned Close Hatches. In the field as well is graded stakes winner Baby J’s second foal Motagally by Union Rags. Trained by Chad Brown, Motagally improved his running position slightly to finish fifth in his first race. 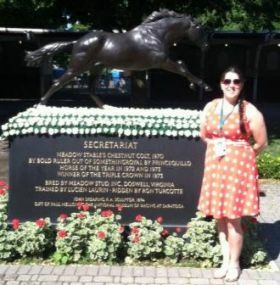 Post time is 2:17 p.m.
Life At Ten had the misfortune to come along at the same time as Zenyatta and Rachel Alexandra, but that has not put a damper on her broodmare career. She has already produced blacktype earner Singing Bullet, and her 3-year old colt Persuasive Cat (Discreet Cat) will debut Saturday for trainer John Sadler in Del Mar’s first race. Owned and trained by the same connections as possible Horse of the Year Accelerate, Persuasive Cat’s works have not been flashy, but you have to imagine that Sadler is feeling confident after getting the Breeders’ Cup monkey off his back last weekend. The race is carded for five furlongs on the turf for 3-year olds and upward. Post time is 3:30 p.m.
Balance, Zenyatta’s half-sister and millionaire in her own right, will be represented by Out of Balance in Del Mar’s ninth race, a one-mile turf race for 2-year old fillies. By Kitten’s Joy, Out of Balance was a solid second in her debut going down the hill at Santa Anita. She came from off the pace that day and will likely do so again. Trained by David Hofmans, the filly will once again be piloted by bug rider Assael Espinoza. Out of Balance will face nine rivals. Post time is 4:30 p.m.